Joshua sent two men to spy on Jericho. The two spies arrived at Jericho and came to a house where a prostitute lived. The name of the prostitute is Rahab. Someone saw the spies and reported them to the king of Jericho. So the king of Jericho sent men to capture the two spies. When the men came to Rahab’s house to search for the two spies, Rahab decided to help the two spies. As soon as Rahab had finished spoken to them, the men went out of the city gate to pursue the two spies sent by Joshua. Actually Rahab had the two spies in the flax which she had arranged on the attic of her house. 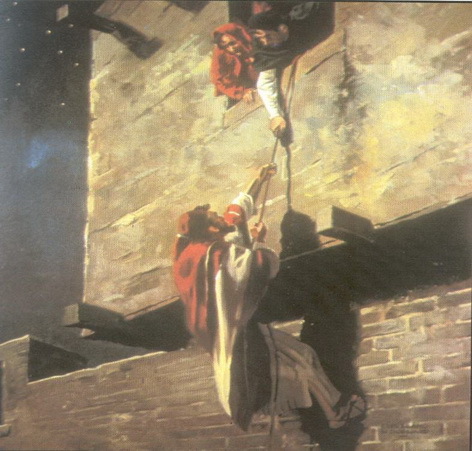 The two spies agreed that they will not kill Rahab and her family during the attack. So Rahab helped the spies to escape by letting out a scarlet cord. When the two spies returned to Joshua, they told Joshua everything.